All military forces are steeped in tradition. One such tradition is the military parade. However, unlike the civilian parades, military parades are typically not only an opportunity to “show the flag” but to brag and boast about the latest and greatest equipment and manpower that armed force possesses. In West Berlin, during the Cold War, those parades were the critical to ensuring the World War II victorious allies not only showed the flag but acted to reinforce the British, French, and U.S. commitment to the city and all the citizens of Berlin. 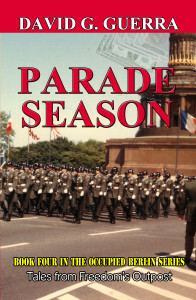 Also in West Berlin, these military parades occurred during the time of year that would guarantee maximum visibility, late Spring and Summer. This Parade Season in Berlin was also a great opportunity for the young men of the Infantry units of the Berlin Brigade to not only “show the flag” but to venture out and explore all that the city has to offer. Unfortunately, for a rare few what the city offers can come at a price. US Army PFC David Gutierrez and his Army buddies suffer through the parade practices, parades, trips to East Berlin, girlfriends and barracks life during that one crazy Parade Season in the summer of 1985.